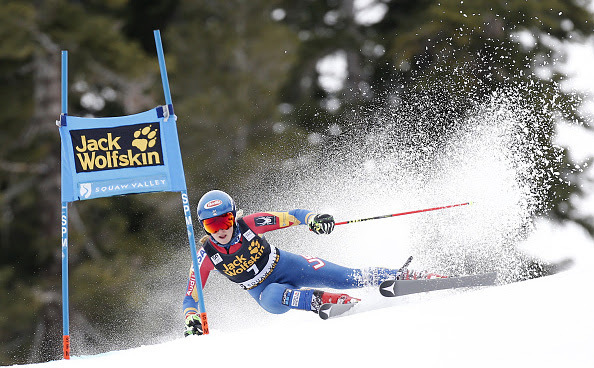 Squaw Valley, CA – It was quite a weekend for Colorado’s Mikaela Shiffrin, who won both World Cup ski races in Squaw Valley — a giant slalom and a slalom — and in the process secured the World Cup slalom title. Her two weekend victories also gave Shiffrin a healthy lead in the points race for the World Cup Overall title heading into the finals in Colorado. More than 8,000 ski racing fans lined Squaw Valley’s Red Dog course for Friday’s giant slalom. Friday’s victory was Shiffrin’s fourth career World Cup giant slalom win and 30th career World Cup victory. Italy’s Federica Brignone finished second, followed by World Cup giant slalom leader Tessa Worley of France in third. Shiffrin won the first run by 0.20 seconds over Worley on a warm, spring-like California day. In the second run though, Brignone almost spoiled the American homecoming for Shiffrin, as she put down an amazing run to move atop the leaderboard. Worley, who held a 0.79-second advantage over Brignone, failed to knock the Italian out of the lead. So, it was up to Shiffrin, the final racer down to the mountain. She held a massive 1.14-second advantage at the first split over Brignone, then 0.72 at the second interval. By the time she hit the third interval split though, Shiffrin was trailing by 0.03 seconds. But in classic Shiffrin style, she shifted into overdrive and sneaked across the line to take the victory by just 0.07 seconds. Shiffrin though, was quick to share the triumph of her victory with the hardworking course crew at Squaw Valley, which have managed to provide a world-class racing venue after receiving a record 625 inches of snow so far this season. Similar weather graced the race course as more than 12,000 fans showed up to watch Saturday’s slalom as Shiffrin did it again. Saturday’s victory was Shiffrin’s 25th World Cup slalom win and puts her squarely in the driver’s seat to win her first overall World Cup title next week in Aspen. 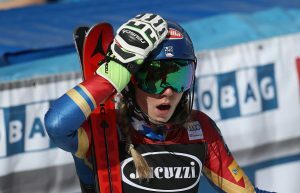 Shiffrin also won her fourth career slalom crystal globe, after her Slovenian challenger Veronika Velez Zuzulova skied out on the first run. Shiffrin became the first skier in history to win the World Championships slalom title and the World Cup slalom title in the same year for the third time. But it wasn’t easy. Skiing on a steep, relentless and fast course, Shiffrin finished second to Switzerland’s Wendy Holdener on the first run. In the second run, just two gates in, Shiffrin got twisted on the steep pitch. But she took the next few gates to find her rhythm, and in characteristic Shiffrin style, drilled the bottom third of the course to take the lead by 1.03 from Sarka Strachova of the Czech Republic. Then it was up to Holdener, who skied the top of the course well, but had to gas the bottom to unseat the American. After the third interval, Holdener held a slim 0.12 advantage, but disaster struck with a few gates remaining as she hooked a tip and skied out. Strachova finished second, followed by Austria’s Bernadette Schild in third. Megan McJames (Park City, Utah) did not qualify for the second run. Resi Stiegler (Jackson, Wyo.) and Lila Lapanja (Incline Village, Nev.) did not finish the first run. Up next, the World Cup Finals take place in Aspen, Colorado, March 13-19. Downhill training is scheduled for Monday and Tuesday, with the downhill race scheduled for Wednesday.